This seems to be a running trend in Scotland, churches repurposed as restaurants and I am not complaining. It is the perfect atmosphere to reflect on the days adventure. Cottiers was apparently dog friendly as well, in case you can't separate from your pup and they joined you on your travels. Above is their Warm Goat Cheese Salad, with no lack of goat cheese, might I add. They also have a BBQ with corn on the cob, hamburgers and wine. Everything goes with wine, in my opinion. While in Scotland a tasty dessert (or morning snack, you are on holiday) is Tunnock's Caramel Wafer Biscuits. I couldn't just have one and might I add, they pair with wine nicely. After wondering along the Royal Mile we turned off to head down The Mound to Princes St. and bumped into these cranberry, apple and brie sandwiches. Their prettiness stopped us, I mean they are tied together with rope. You can't beat that and since we always judge a book by its cover we walked away from Zebra Coffee Co. with two. Oh, and they tasted just as good as they looked. I want to become a regular here, it was just too good and the atmosphere was divine. Their coffee was delicious and their scones with butter and jam were finger lickin' good. I can smell a breakfast sandwich from a mile away and Rocket Cafe did not disappoint. I ordered their bagel sandwich with streaky bacon, a fried egg, rocket and chili jam. Yum, yum. I wonder if they serve breakfast all day? There were actually two breakfast bagel sandwiches on the menu. The other one came with black pudding which is blood sausage. I'm sorry, did you say blood? Don't get me wrong I want to try the Scottish cuisine just not for breakfast before I've had a cup of coffee. 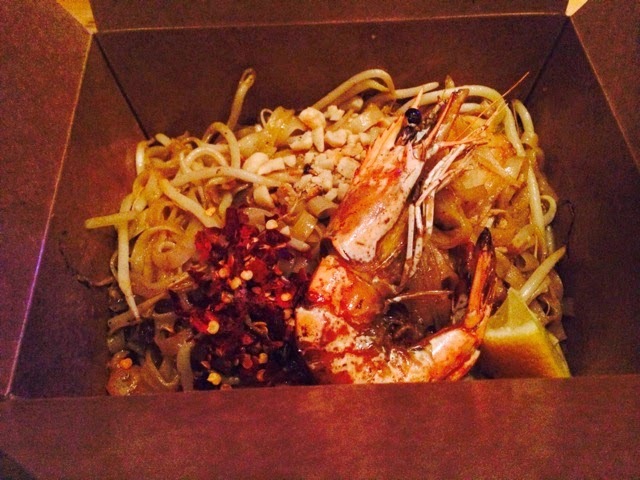 Take me to Thai food any day and if it comes with an entire shrimp I'll be even more excited. Ting Thai Caravan is a new Thai restaurant that always has a line out the door. Although I ordered the most predictable meal ever, I was craving it and it was on the menu. Every bite of pad thai was better then the next. I could have gone for seconds but I would have had to change from jeans to sweatpants, stat. My only complaint was their meals came in to go boxes. I'll admit I have been caught throwing paper into the trash instead of the recycling but for a restaurant to not use reusable bowls? I mean come on, can't you find another way to be a hipster. The night at the pub started off with a toast to Kim and Ian on their engagement and then things got wild when we started ordering haggis bonbons and black pudding. The haggis was surprisingly good, granted it was fried which makes anything taste delicious but it really was. Before long I was onto my third haggis bonbon and really getting into the broom sauce. The black pudding was a completely different texture then I was expecting and it was a pleasant surprise. More blood black pudding, please. You mean I can have a slice of chocolate cake mid-afternoon and no one will judge me? Sign me up and make it a big one.